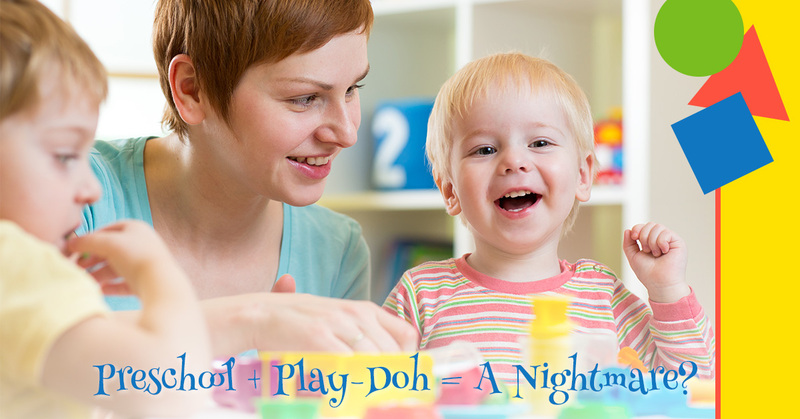 Preschool + Play-Doh = A Nightmare? If you’ve ever worked with children and play-doh, you know what a disaster it can be. You think you’re doing something fun and amazing for your kids by getting out the play-doh, but before you know it, all the colors are mixed together into a sick color of brown, there are play-doh crumbs scattered in a radius at least 10 feet around the table, and a week later, you’re still finding play-doh chunks ground into your carpet. However, play-doh time does NOT have to be a nightmare, and you might even have fun yourself by following these tips. Check out these ideas from our preschool-age daycare teachers in Upper Darby. Approach play-doh time as an opportunity to spend quality time with your preschooler, NOT as a method to give them a way to entertain themselves while you do other things. Once your children are older, they’ll be able to play with play-doh unsupervised, but for smaller children, it’s just an invitation for disaster. Play-doh time should last 15-20 minutes max for children of preschool age, and ideally, you should stop the activity BEFORE they are bored of it. If you sense that they are starting to lose interest at the 10-minute mark, don’t keep stretching their interest. Instead, announce that it’s clean up time and show them how to put everything away with you. Even if your child’s attention is still super-absorbed at the 20-minute mark, you’ll be teaching them a valuable life skill about how to transition from one activity to another, which will serve them later in life. Don’t let the play-doh touch the floor. Explain, “We’re trying to keep all the play-doh on the table. If it touches the floor, it’ll probably get full of crumbs and hair. Gross.” Children will often try their best to comply with this if you explain the importance of it up front. Playing with play-doh is valuable to preschoolers’ development because it enhances their fine motor control and it improves their artistic ability (being able to visualize a 3-D shape and then model it out of clay is a very advanced skill). However, little kids have no clue how to approach play doh without your help. Start by teaching them two basic skills: How to roll a rope and how to form a ball. Practice these skills and make them fun by doing things with your rope, like winding it into a rug or making a play-doh “bowl” and filling it with play doh “peas.” Then move to more complicated pursuits, like showing them how to make a teddy bear (a large ball for the head, small balls for the ears, eyes, and nose, a ball for the belly, and logs for the arms and legs). Your kids will love the fact that you took the time to play with them, and you’ll set them—and yourself—up for great play-doh success. No more nightmares! Darlene’s Wee Care for Kids is a full-service infant and child care center offering day care, early childhood education, and a safe, nurturing environment to children from 6 weeks to 13 years old. Enroll your child today!